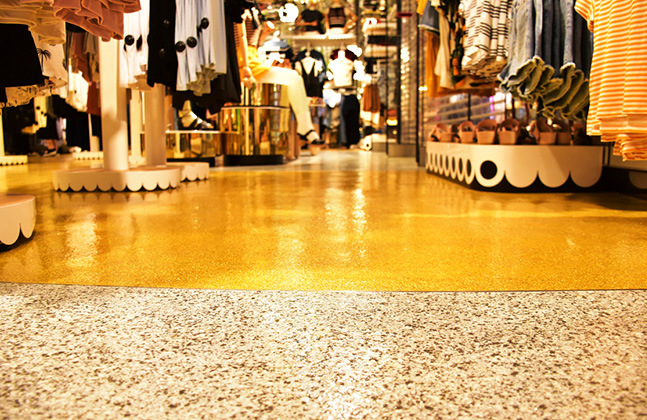 Home / Monki Goes for Gold with New Store Floor! 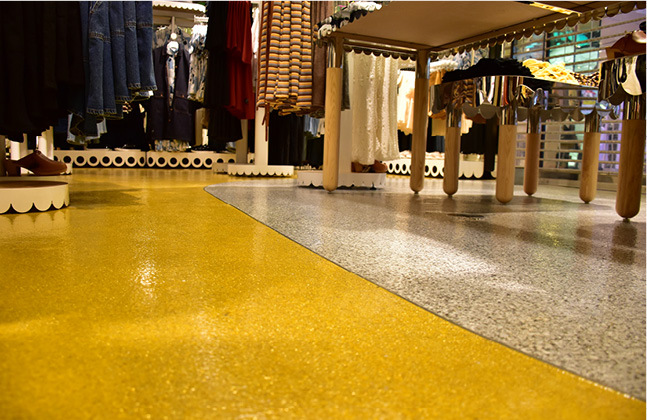 Monki Goes for Gold with New Store Floor! 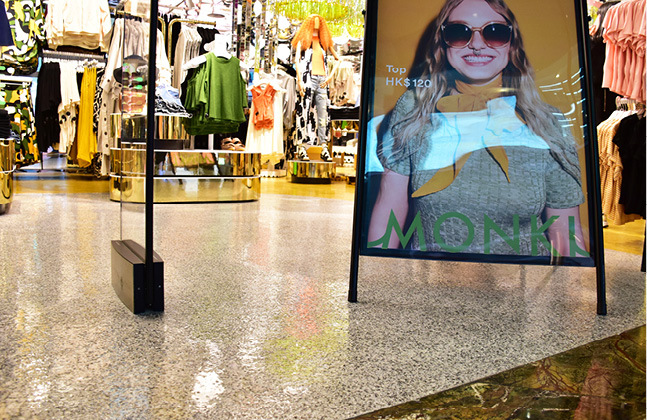 The vibrant fashion designer Monki has created a bright and glittering gold floor within its new Hong Kong store using 200m2 of the epoxy resin system Flowflake Kristalina. 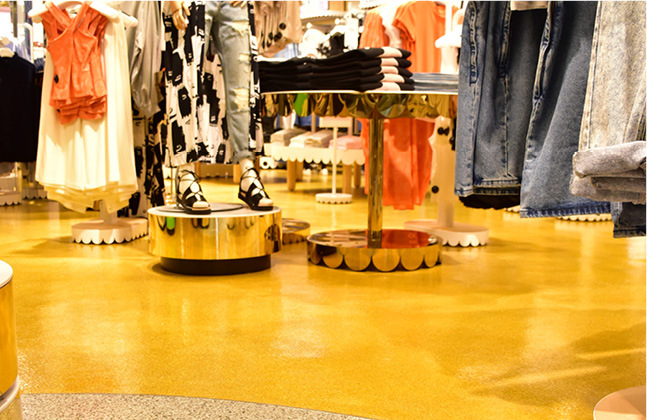 Flowcrete worked with Monki in order to provide a floor that would convey the brand’s colourful, vibrant and youthful image. This led to the fashion label’s interior designer choosing two tailor-made styles, a glamorous gold and a sleek, dappled silver and black. 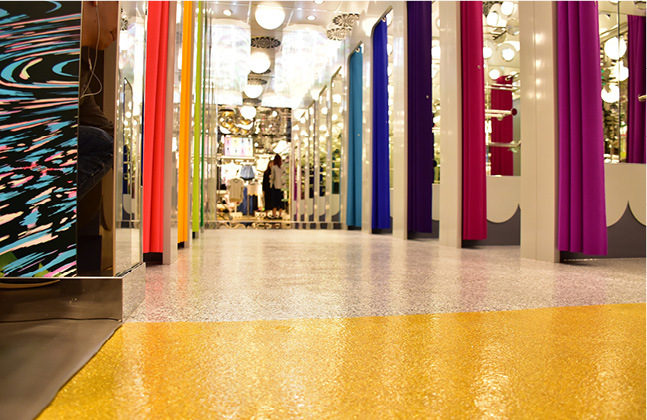 The stylised flooring systems were applied next to each other across the retail outlet’s floor in contrasting blocks of colour. Curving lines were used to separate the colours, creating not only an interesting visual effect but also marking out different areas of the store. The glossy, light and dark patterned silver coating was installed in the entrance and changing room areas while the majority of the shop floor itself was coated in a solid swathe of the dazzling gold. This design created a luxurious aesthetic that would serve as the ideal backdrop for Monki’s eclectic and lively line of high-end fashion. 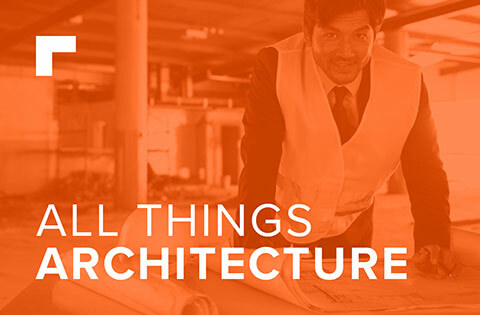 The bespoke look and attention to detail would reinforce the store’s identity and ensure that new customers are left with a great first impression. 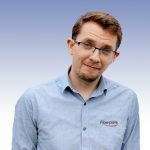 The seamlessness of the decorative epoxy system Flowflake Kristalina means that it can be quickly and easily cleaned to keep the floor area looking its best. Flowflake Kristalina’s hardwearing nature also avoids scratches, scuffs and stains so that the floor retains an unblemished appearance for the long term. 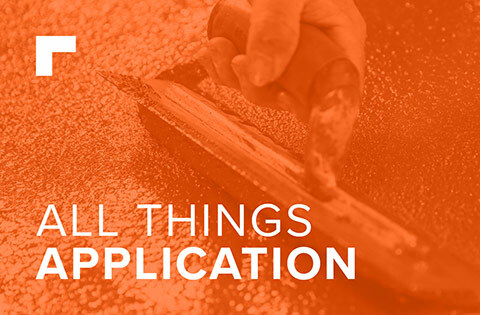 The entire flooring project took only five days to complete. 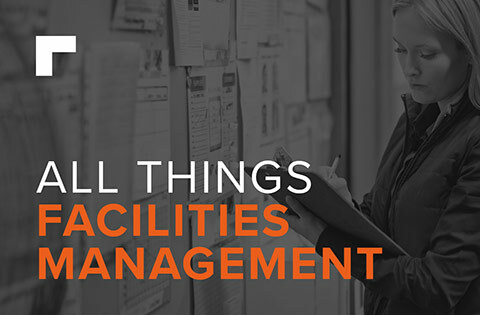 It was critical that this deadline was met, as the high rental rates and the fact that other trades had to be accommodated meant that no aspect of the store fit-out could overrun. 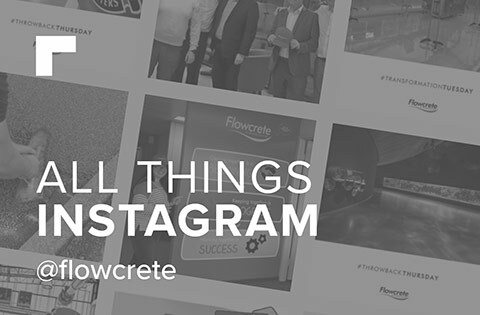 If you’re interested in finding out more about flooring options for retail outlets then click here to download Flowcrete Asia’s whitepaper on floor design considerations in commercial venues.